The Archaeopteryx is known by many as the first bird ever known and is also thought by some to be proof of a link between dinosaurs and bird life. While a precise link remains to be found between the characteristics of the Archaeopteryx developing from the large terrestrial dinosaurs of its time, there is no doubt that there is evidence that this prehistoric bird had links to its land dwelling neighbors. The Archaeopteryx lived during the late Jurassic period some 150 – 148 million years ago. It is considerably smaller than pterosaurs like Quetzalcoatlus measuring only around one and a half feet in length and is believed to have had many similar characteristics to Theropod dinosaurs than it did to modern day birds. As a result of common features the Archaeopteryx shares with dinosaurs of its time, this feathered dino bird is proof that modern day birds most likely did evolve from land dwelling dinosaurs. This small airborne creature provides not only information in regards to a link between dinosaurs and birds but it also provides information on the history of evolution among birds. The Archaeopteryx is perhaps most well known as having feathered wings; its are not that different from the feathers of modern day birds. It is debated whether land dwelling creatures at this time had begun developing feathers as well as some show quills in fossilized specimens which hint at the presence of feathers on their skin. The feathers of the Archaeopteryx as well as the presence of hollow bones which made flight possible make it the first known bird of prehistoric times. The Archaeopteryx also had reduced fingers much like common day birds but in contrast to these birdlike features it also showed evidence of quite a few links to the terrestrial Theropods of their time. Did Archaeopteryx Have Dinosaur Features? The Archaeopteryx had a variety of dinosaur like features, particularly the presence of three fingered claws at the end of its wings. Modern day birds obviously do not show the presence of claws or hands of any sort at the tips of their wings; however, Deinonychosaurs possessed similar clawed hands. The Archaeopteryx also had teeth; although these teeth were small they present a link between terrestrial dinosaurs of the time and a significant difference between modern day birds. The Archaeopteryx is believed to have eaten insects so the reason for these teeth is perhaps more a result of evolving from a terrestrial dinosaur rather than a result of evolving to be able to eat a specific diet. The Archaeopteryx also showed similarities to Deinonychosaurs in that they featured a long tail that was particularly bony. Land dwelling dinosaurs of the Archaeopteryx’s time were almost all characterized with tails of some sort while modern day birds do not have such appendages. Our dino bird is also known to have had a flat breastbone and ribs along the belly which are two skeletal features that are found in reptiles and not in modern day birds. In addition to the features listed above the Archaeopteryx also retained a “killing claw” which featured on the second toe of the foot. This hyper extensible claw can be seen in a variety of dinosaurs including Deinonychosaurs and was used in the killing of prey. While it is not believed to have used this second toe for killing prey due to its diet of insects, its presence suggests that it remained as a remnant of evolution from a terrestrial, carnivorous dinosaur. The Archaeopteryx may indeed have evolved from dinosaur reptiles; however, it most certainly did not retain the size of these reptiles! On average the Archaeopteryx was no bigger than a crow. Its was around one and a half feet and from beak to tail it measured around a foot to a foot and a half in length. The weight of this relatively small first bird was approximately 11 to 18 ounces, to put that into perspective the Archaeopteryx weighed around the same as a bag of coffee beans. Its light weight is a result of its hollow bones and its light frame that are the very reason that it is able to fly. While the Archaeopteryx was indeed capable of flight, recent studies by paleontologists conclude that it was not a particularly skilled pilot, nor would it have been able to sustain flight for any extended period of time. Its feathers are one reason why paleontologists came to this conclusion; they are simply not constructed to allow long term flight. For this reason paleontologists believe that the Archaeopteryx was much like the modern day peacock in its flying ability and depended on its ability to run quite a lot of the time. The feathers of the Archaeopteryx were remarkably similar to the structure of modern day birds “flight feathers” and were asymmetrical on its body. The tail feathers of the Archaeopteryx were more uniform yet both sets of feathers were vaned like modern day birds feathers. There has only yet been one specimen of Archaeopteryx discovered which allowed paleontologists to discern anything in regards to the feathers that covered its body. While a Berlin excavated specimen shows evidence of the presence of feathers along the legs of the Archaeopteryx, there is also evidence of pennaceous feathers along its back. Aside from these features the feathers that covered the body of the Archaeopteryx were much more down like than found in modern day birds, in fact they bore more resemblance to the fluffy down found on the Sinosauropteryx (a small, non-avian Theropod.) Due to the lack of adequate specimens it is unknown by paleontologists at this time as to whether the Archaeopteryx had feathers or down over its head or neck. Some paleontologists believe that this is due to the fact that the Archaeopteryx had a more reptilian scaled look to its head and upper neck; however, some paleontologists believe that this is a result of the decomposition process in the specimens found to date. While the Archaeopteryx may have had feathers, its flight was not simply determined by their presence. As mentioned above the Archaeopteryx featured a flat breastbone which would have lacked the strength needed by a frequent high flying bird to maintain height and flapping motion. Paleontologists have also suggested that due to the sideways anatomy of the Archaeopteryx shoulder joint the Archaeopteryx would have been unable to lift its wings above its back bone which suggests that these first birds would have been capable of gliding only. Without the ability to create an “upstroke” the Archaeopteryx would not have been capable of flapping flight. While it may not have been capable of flapping flight like modern day birds, it did have larger wings which would have allowed it the ability to fly through trees without damaging its wings as more fragile and smaller winged birds would have done. The size of its wings, however, would have made it increasingly difficult for it to maneuver in the sky, giving it a larger turning radius. In consideration of the combination of bird like and Theropod like features of the Archaeopteryx, paleontologists have drawn a few conclusions in regards to its role in the evolution of birds. Some paleontologists believe that the Archaeopteryx were tree dwelling birds which had the ability to climb with their claws as well as the ability to glide. These paleontologists believe that birds therefore evolved from gliders proving the “trees down” theory of bird’s evolution of flight. Other paleontologists, however, believe that due to the fact that the Archaeopteryx most likely ran with spurts of flying and as a result learned to fly by first running. These paleontologists believe that birds therefore learned to fly from the “ground up” theory of bird’s evolution of flight. There are those who believe that the Archaeopteryx was not particularly suited to either the ground up or trees down theory of evolution due to the fact that it was not a particularly well adapted runner or perching bird. These paleontologists, like Elzanowski, suggest that the Archaeopteryx most likely relied on its wings to glide out of reach of predators, utilizing their ability to reach higher perches away from said predators. It is also suggested that its wings were used to glide longer distances from cliffs or treetops in order to reach the ground. The first discovery of the Archaeopteryx came in 1860 when a solitary feather was found, paleontologists cannot be certain that this feather is actually from the Archaeopteryx or another species of prehistoric bird but it remains on display at the Humboldt Museum fur Naturkunde in Berlin. Following the discovery of the single feather the next big discovery came about in 1861 when an actual Archaeopteryx skeleton was located near Langenaltheim, Germany. The skeleton was given to a doctor during this time as a form of payment; however, he later sold it to the London Natural History Museum. This particular Archaeopteryx specimen was by no means complete, with most of its skull and neck vertebrae missing; however, its timing with Darwin’s “On the Origin of Species” meant that it provided a potential missing link in the evolution of birds from terrestrial creatures. Since the discovery of the first Archaeopteryx skeleton ten other specimens have been located. The most complete of the ten discoveries is referred to as the Berlin Specimen and was discovered around 1876 near Eichstatt, Germany. This discovery was made by Jakob Niemeyer, however, it was exchanged for a cow and ended up in the hands of Johann Dorr who put the fossil up for auction in 1881. The specimen wound up being purchased by the Humboldt Museum fur Naturkunde and can still be found there to this day. 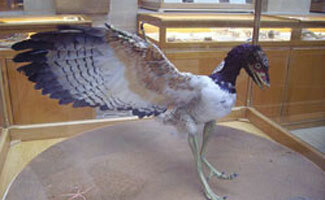 The Berlin Specimen is considered to be a particularly special Archaeopteryx specimen in that it is the first specimen to be located with a head intact. Further specimens include the Maxberg Specimen discovered in 1958 near Langenaltheim. This specimen is comprised of the torso of the Archaeopteryx and is believed to have been stolen in 1991. Another significant specimen discovery is the Haarlem Specimen was excavated in 1855 near Riedenburg, Germany by von Meyer. This specimen is composed of limb bones, cervical vertebrae and ribs. Although originally classified as a Pterodactylus, this specimen was later reclassified as an Archaeopteryx and is considered the first true Archaeopteryx specimen to be discovered. The Missing Link In The Evolution Of Birds? Whether the Archaeopteryx is or is not considered to be the missing link in the evolution of birds by paleontologists across the globe, there is no doubt that this first primitive bird showed promising signs of evolving from terrestrial reptiles. While there are only eleven specimens of Archaeopteryx in existence at this time, the hope is that future, more complete specimen excavation can reveal more about this primitive bird and fill in a few more blanks in terms of the evolution of the modern day bird. The specimens currently in possession of museums across the world do provide valuable information as to the structure of the Archaeopteryx and its possible path of evolution in regards to both avian and reptilian physiological features. However, it is important to remember that very few of the current specimens are complete or even nearly complete and as a result they can only fill in a few blanks at a time in regards to certain species of the Archaeopteryx. Still, as the saying goes, something is better than nothing and in this case considerable more information is known about the Archaeopteryx today than was previously known before the study of physiological features such as the bone structure of the first complete specimen. By utilizing modern technology and comparing the structure of the eleven known specimens of Archaeopteryx to the structure of modern day birds as well as Jurassic reptiles, paleontologists are uncovering more information about this primitive bird than ever before! The Archaeopteryx has got to be my favorite dinosaur, and always has been (despite it being somewhat difficult to spell!). I love birds and dinosaurs, and was always amazed that a dinosaur could have feathers. Thanks so much for running this site and bringing us the latest and greatest from the dino world! !